I have posted a 250 lines reference implementation for review at CR, discussing the major class of the code. Download the complete Visual Studio 2013, .NET 4.5 source code (10 kB) from my server. This is based on a real world puzzle. A colleague had a very old program. It was announced to be discontinued by the company and then it was really discontinued in 2009. Now I should use that program as well, but it is full of bugs and I refused to use it. Instead I wanted to help my colleague and converted the content into a reusable format so we could import it to any other program. The data is in a database, but the scheme is horrible because it creates new tables every now and then, so doing a SQL export was not feasible. The program also does not have an export functionality. But it has a reporting capability. Bad luck: reporting to Excel fails, because the output is larger than the 65.000 lines allowed by the only old excel format it supports. The only option left was reporting to HTML. The reports is hierarchically structured in either 2 or 3 levels. the HTML is horrible (IMHO), it consists of DIVs and SPANs only, each having a @style attribute specified. The left position of the style at a SPAN can be used to detect the indentation, which allows conclusions to get the number of levels. The key may be followed by another SPAN which defines the value. If the value is not present, it shall be considered as an empty string. As far as I can tell, the HTML is technically ok. All tags are closed etc. but it's not XHTML. You needn't do any error checking on it. Side note: I don't need your code to solve a task or homework. I have already implemented a converter but to a different output format. Code Golf. The shortest code wins. Hopefully the task is complex enough to make it hard for special golfing languages so that other languages have a chance as well. Libraries are allowed. Loophole libraries specially crafted for this task shall be downvoted. Answer with shortest code on 2015-03-14 gets accepted. The code shall be able to process all kinds of reports the program produces, so do not hard code any keys or values. 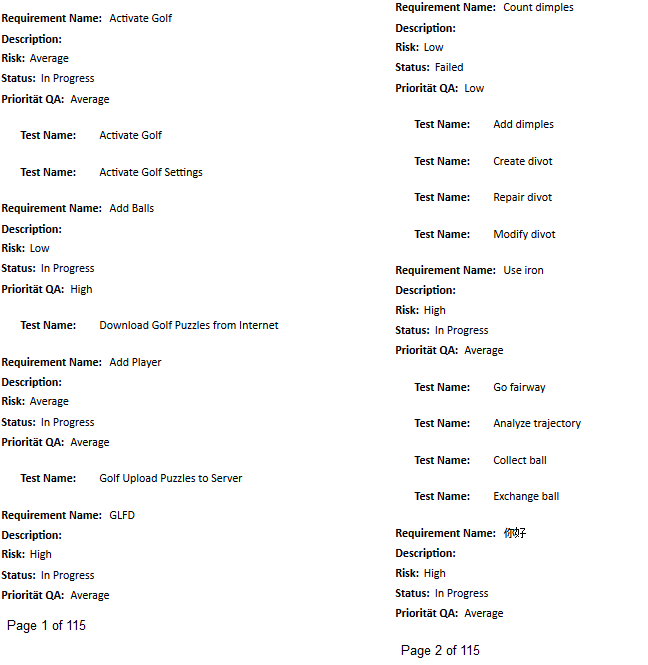 Here's an anonymized 2 page except of one of the reports. "TestName": "Download Golf Puzzles from Internet"
"TestName": "Golf Upload Puzzles to Server"
VBScript is NOT designed for golfing and I am not great at golfind anyway so the best I can do is 819. If you see a way to make it shorter please comment. If L>M Then W.Echo X&"""Children"":[":X=""Else If Abs(T-U)>.3And U>0Then W.Echo"}":X=","
Not the answer you're looking for? Browse other questions tagged code-golf json or ask your own question.